I was really impressed with the song sheets Ton and Conny brought to the Rally last summer. It was great fun singing with everyone in all our languages. I thought the song sheets could use a ‘refresh’ as they looked like they had been photocopied many a time. Enclosed please find a softcopy. I thought perhaps you could find an appropriate spot on the website to store them and perhaps over time, we could add to it as needed. I’m filling out my membership application for LDSC, so thinking warm sailing thoughts this cold night. Great idea, Lori. I will convert your work to a nicely printable PDF file and post it on the WIC site where I have added you material to Jesper Friis' International Wayfarer Song. Stay warm - my computer tells me that it's -10C outside - and no doubt it's even colder in Ottawa!! Many Wayfarers join one or the other of our National Class Associations with little or no fanfare or ado. A few are even so lucky as to get a little tuning guide. And then there are the new members of the Scandinavian Wayfarer Association. They get a tuning guide of a different sort - the one shown at left. 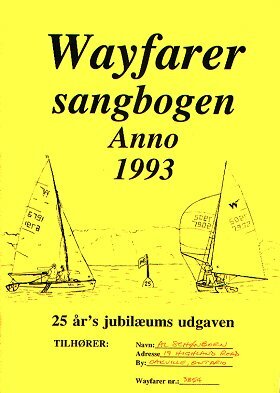 It is a compilation of dozens of songs dedicated to Wayfarer sailing that have been written by various Scandinavian Wayfarers and use the melodies of assorted well known songs. This is one of the reasons why the Danes have as much fun after they sail as on the water. I’ve been a wild sailor for many a year. I’ve spent all my money on gofast and gear. to join all my fellows in sailing a while. While sailing we’re shouting and laughing whole time. We’re hiking and tacking and planing quite fine. how wonderful life is with plenty of beer. and then drink a toast to our Wayfarer class. and now we will stand up and give us three “cheers”.